EPSTEIN-BARR VIRUS AND CYTOMEGALOVIRUS – TWO HERPES VIRUSES WITH ORAL MANIFESTATIONS. Department of Oral Imaging and Oral Diagnostic, Faculty of Dental Medicine, Medical University Sofia, Bulgaria. Diseases caused by cytomegalovirus and Epstein-Barr virus are reported with increasing frequency. Epstein-Barr virus damages usually are due to reactivation of latent infection. while cytomegalovirus disease result from primary or reactivated infection in susceptible hosts. The booth infections can have oral manifestations. Key words: oral cavity, cytomegalovirus, EBV. Krasteva A. Epstein-Barr virus and Cytomegalovirus - two herpes viruses with oral manifestations. J of IMAB. 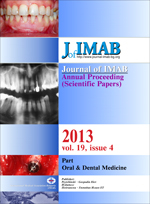 2013; 19(4):359-362. doi: 10.5272/jimab.2013194.359. 3. Greenberger M, Glick M, Ship J. Transplantation medicine in: Burket’s oral medicine. 2008, 461 -481. 23. Marder M, Barr CE, Mandel ID. Cytomegalovirus presence and salivary composition in acquired immunodeficiency syndrome. Oral Surg Oral Med Oral Pathol. 1985 Oct;60(4):372–376. [PubMed].